This chapter discusses a case-study from a Higher Education institution in Surrey, where a project of pedagogical innovation, the ‘Transition Programme’, successfully solved the paradoxical status of selective procedures that are caught between the principle of inclusiveness within the widening participation agenda and the contrasting principle of recruiting with integrity. The chapter is motivated by four main aims. 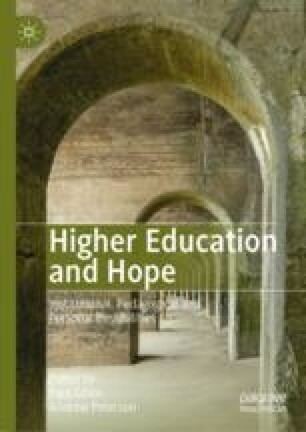 The first aim is to use hope to contextualise sociologically the motivations underpinning mature applicants’ choice to access Higher Education. The second aim is to approach such choice as a movement from the familiar world to a more complex social world, characterised by risky decision. A third, and probably central, aim is to criticise the implications of selective processes for mature applicants’ trust in the Higher Education system, as well as their well-being, self-esteem and happiness. Finally, a fourth aim is for the author to re-contextualise within a discourse centred on hope in the Transition Programme. Department for Business, Innovation and Skills (2010). Widening Participation in Higher Education 2010. Official Statistics Release: Full-time Young Participation by Socio-economic Class. https://www.gov.uk/government/statistics/widening-participation-in-higher-education-2010. Accessed January 6, 2018. HEFCE. (2015a). Differences in Degree Outcomes: The Effect of Subject and Student Characteristics. Higher Education Funding Council for England. http://www.hefce.ac.uk/media/HEFCE,2014/Content/Pubs/2015/201521/HEFCE2015_21.pdf. Accessed January 9, 2017. HEFCE. (2015b). POLAR—Participation of Local Areas. Higher Education Funding Council for England. http://www.hefce.ac.uk/analysis/yp/POLAR/. Accessed October 13, 2018. Idan, O., & Margalit, M. (2013). Socio-emotional Self-perceptions, Family Climate, and Hopeful Thinking Among Students with Learning Disabilities and Typically Achieving Students From the Same Classes. Journal of Learning Disabilities. https://doi.org/10.1177/0022219412439608. The Office for Students. (2018). A New Approach to Regulating Access and Participation in English Higher Education Consultation Outcomes. https://www.officeforstudents.org.uk/media/546d1a52-5ba7-4d70-8ce7-c7a936aa3997/ofs2018_53.pdf. Accessed February 4, 2019. UNESCO. (2003). Information and Communication Technologies in Teacher Education. Available at http://portal.unesco.org/en/ev.php-URL_ID=15006&URL_DO=DO_TOPIC&URL_SECTION=201.html. Accessed October 20, 2018.